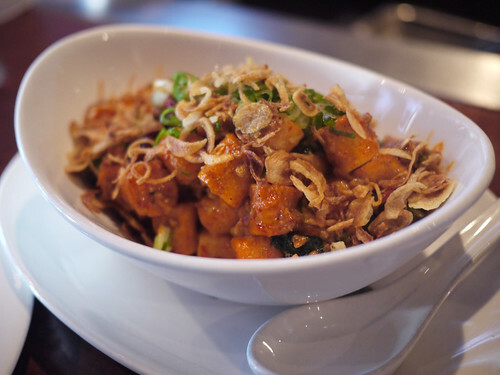 Photos from Esther and my summer meal at Momofuku Ssam Bar, which is still one of my favorite places to eat in the East Village. A seasonal cocktail and the Penicillin – scotch, lemon, honey and ginger…all my favorite ingredients in one beverage with a giant ice cube. 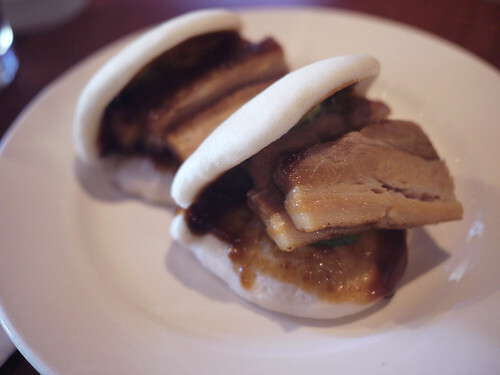 The famous steamed pork belly buns with hoisin, cucumber, and scallions. Still so good that I could make a full meal out of these babies. 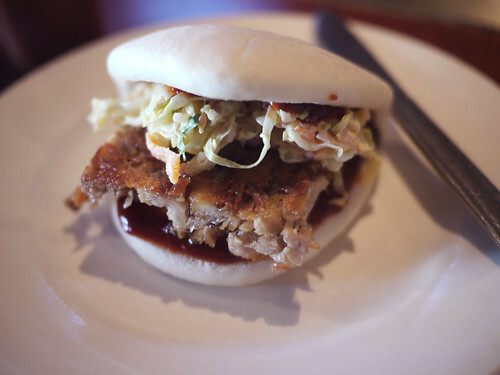 A new addition to the menu since my last visit – bbq buns with crispy pork belly, coleslaw, and smoked mayo. Maybe it was the novelty of the dish, but I think I actually preferred this version to the original, and Esther and I seriously contemplated ordering more. A classic – spicy pork sausage and rice cakes. I always tell myself that I won’t order these again, but something about the crispy starch mixed with the crunchy Chinese broccoli and spicy meatiness of the sausage just keeps calling me back. 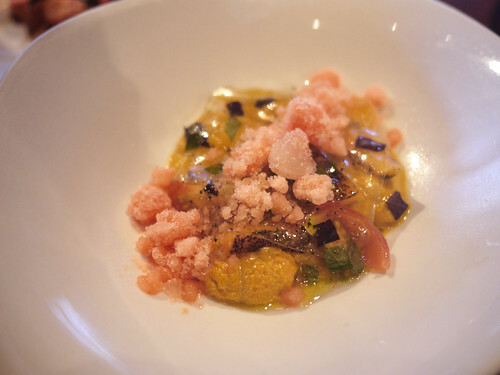 Silky Santa Barbara uni with some melon ice and a strange but tasty gelee (I vaguely remember a porky, ham flavor) with summer tomatoes. 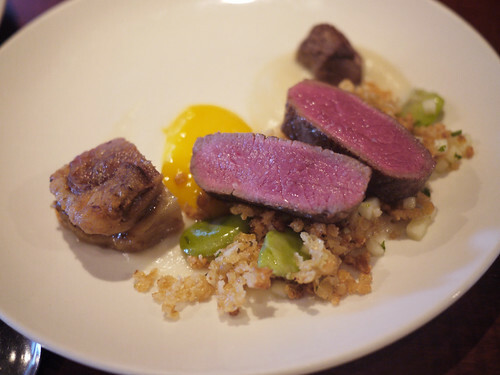 Beef, two ways, with bulgur, fava beans and soubise. I think this may have been the first time I’d had bulgur actually and it was totally great – nutty flavor and a toothsome texture. The meat, as you can see, was also perfectly cooked. Just goes to show that while it may be easy to fall into the same great dishes again and again, it’s definitely worth your while to try new dishes at places where you’ve eaten many times in the past. 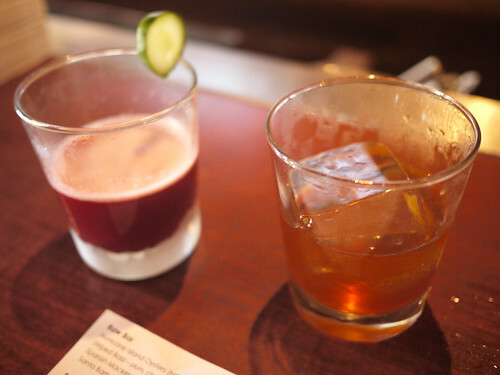 You are currently reading Branching out at Ssam Bar at Notes on Food.